Northern Michigan Music: James Filkins, joins his songwriting and acoustic guitar playing with four artists in his new music CD, Summer Sands & Sleeping Bears. He has captured the mood of strolling along Good Harbor's sandy beach, scaling the infamous Dune Climb or hiking Pyramid Point allowing listeners to musically bring Sleeping Bear Dunes anywhere they play music. Summer Sands & Sleeping Bears has 13 summer songs that capture the serenity of Sleeping Bear National Lakeshore: birds flying overhead, large dune grasses brushing each other as they sway, waves crashing against the endless shoreline and animals scurrying along the forrest floor. These are the soothing sounds unique to the Sleeping Bear National Lakeshore that avid park attendees know and love. Filkins is joined by additional musicians, Steve Reinthal, Leslie Ann Harrison, Tim Lorsch and Zac Leger. Together, through finger picking guitar methods and soft flute sounds, these talented artists translate the beauty of Northern Michigan into peaceful musical expression. The original songs presented on this CD are uplifting tunes that mirror Northern Michigan summer days. They are soft and serene yet captivating and powerful, similar to the sites and sounds of our beloved Sleeping Bear Dunes National Lakeshore. 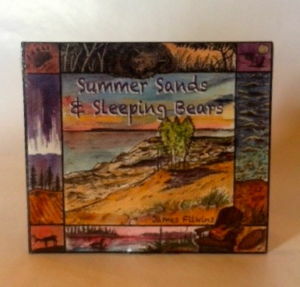 The beautiful cover of Summer Sands & Sleeping Bears was done by local artist Glenn Wolff. Glenn's original artwork was also featured on Filkins first CD, Borderline Normal, and is sold in our MyNorth Store.